Popular American female musician, Beyonce is believed by her fans to be pregnant with her fourth child. Beyonce fans have been quick to notice that the pop star may be hiding a growing baby bump while performing on stage during her massive world tour with her husband. Fans took to social media in speculation that their Queen Bey is pregnant, with various photos and videos to back up their claims, while sources at Star magazine revealed the Crazy In Love songstress is ‘over the moon’ with her pregnancy news. 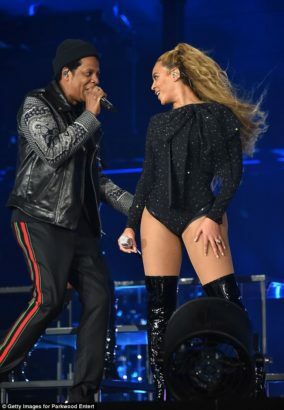 Fans were quick to take note of Beyonce’s wardrobe choices during her recent European stops on the tour, which the couple has slated for 48 performances around the world. Showing off what appeared to be a baby bump, a Twitter follower has convinced the star was hiding something underneath a long sparkling coat.